Odissi dance is an expressive classical dance that takes one through the fullest range of emotions. This devotional dance has been passed on from guru to disciple for over 2,000 years, making it the oldest known temple dance still in practice. Odissi dance is an expressive classical dance that takes one through the fullest range of emotions. This devotional dance has been passed on from guru to disciple for over 2,000 years, making it the oldest known temple dance still in practice. 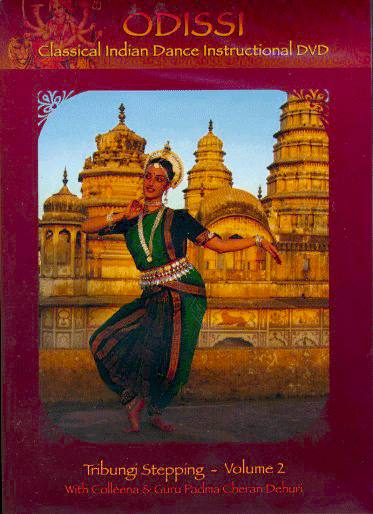 Originating in the temples of Orissa (East India), Odissi dance is taught as a means of worship and personal surrender. This style of classical Indian dance is praised for having distinctly feminine postures, with exaggerated hip curvatures, and graceful movements of the torso. With Colleena Shakti and Guru Padma Cheran Dehun. *Two prayers to use at the beginning of your dance practice. *Three bonus chapters on isolated body movements. *Tribungi 1-10 stepping exercises with breakdown of steps into upper body and lower body. This DVD is a rare jewel. I use volume 1 of this DVD series for my movement meditation. This DVD is a delight to watch and follow. However, for the moment the practice is too much of a challenge for me to put into practice myself.